After reading the partially shocking above mentioned information about magnesium, You may feel "angry", because You didn't know this before. Since 90% of all people have magnesium deficiency, You are not the only one. However, if this is such an important issue, why do we not hear it in the mass and medical media? Anyway, no matter how high Your deficit may be, there is a good and natural solution for a possible shortage. Of course, various diseases and effects mentioned can have been in operation for some time, but You can be sure that most of the consequences can be reversed. As scientifically proven, human cells do not have to die. In fact, cells can be replaced.... provided that they are nourished with exactly what they need: the best possible revitalized drinking water, touched with the maximum amount of activated oxygen, and an optimal combination of minerals, vitamins and other nutrients, including bioavailable magnesium. In this article we highlight magnesium as one of the most important "players" in the biochemical processes that take place in Your perfectly designed body. So, what do we conclude, after we have all read this? OK, as You have already read, transdermal magnesium absorption is the most efficient way to correct Your deficiency. Furthermore, it is certainly a lot cheaper than taking magnesium capsules, for example, if we consider the maximum 50% effectiveness of this. So our recommendations are indeed mainly focused on transdermal absorption. It may not be so conscious, but Your skin is Your largest organ. This is very useful for the supply of transdermal magnesium. You can therefore apply magnesium externally over a large surface area. Optimum ls if You have a bath: this form of magnesium is best absorbed by dissolving about 2-3 kilos of magnesium chloride flakes in 38°C warm (if possible revitalized) water, supplemented with approximately 1 - 2 pounds of dissolved organic Himalaya-Badya salt containing a further 83 other minerals, and take a bath for 20 minutes. Depending on the suppleness of Your skin and the extent to which the water is revitalized, Your skin opens after ~7 minutes to absorb magnesium chloride dissolved in water. Do not add soap or bathing oil, as this procedure is not intended to wash Yourself. If You do this, You cannot reuse the magnesium water because soap chemically degrades the magnesium effectivity. So it's best to take a hot shower beforehand! Revitalized water enriched with activated oxygen can improve magnesium absorption and effectiveness by up to 400%. Furthermore, high levels of activated oxygen keep bacteria and other organic substances at an absolute minimum. What is also extremely important: it takes care of Your body at the same time with super good water. Make sure You take a 15-minute break afterwards: lying down or sitting comfortably: wellness is also the resting pleasure. In this time, all processes in Your body can be "reactivated"again. Though 38°C is the optimal water temperature, You can feel a little "dizzy", which is a normal effect, after such an intensive wellness treatment. Good oxygen care in the bathroom prevents this "side effect". We know from our own experience that Your body will exchange up to 10 litres of this highly mineralized water, which sounds a lot, but You realise that 70-85% of Your body weight is water. A possible existing dehydration is thus also greatly reduced. The cells and organs in Your body will be provided with appropriate amounts of essential nutrients. You will feel clean, fresh and vital inside and Your skin will feel softer and flush. If You repeat this for a few consecutive days, You can use the same water again by adding hot water again until it reaches the optimal temperature of 38°C. If You use revitalized water, You don't have to worry about the possible risk of infection: the activated oxygen will effectively discourage any bacteria from entering and eradicating them. You will also regain considerable strength, and if You already had digestive problems, they will disappear after a short period of time. Your immune system will also gradually regain its ability to protect Your body from viral diseases. If You just use tap water, it is better to keep taking new water, especially at summer temperatures. After a maximum of three days, it is best to take a break of 4 days before repeating this wellness treatment: it is therefore a weekly procedure to be repeated is part of a wellness treatment of - initially - two to three months, depending on the degree of Your magnesium and other deficiencies, dehydration and acidity (pH) of Your body. 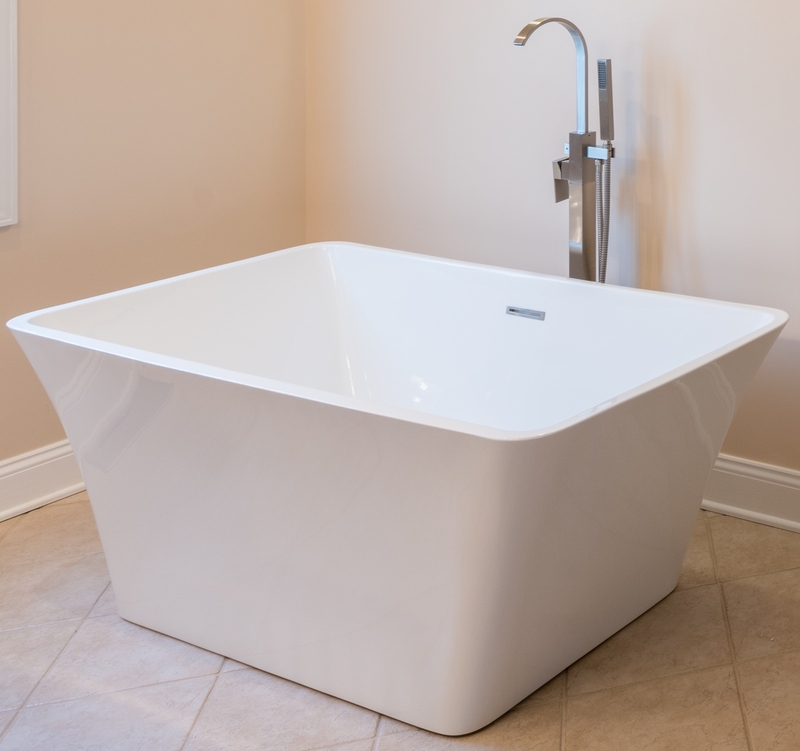 Unfortunately, not many people have a built-in bathtub in their home or home. This is really a pity, because transdermal magnesium absorption is by far the most effective method. However, there is a solution: we found mini bath tubs on the internet, with an average size of 120x70x45cm, in which You can at least sit. They can be placed under Your shower head with the drain opening directly above the drain, so You can still take a shower. 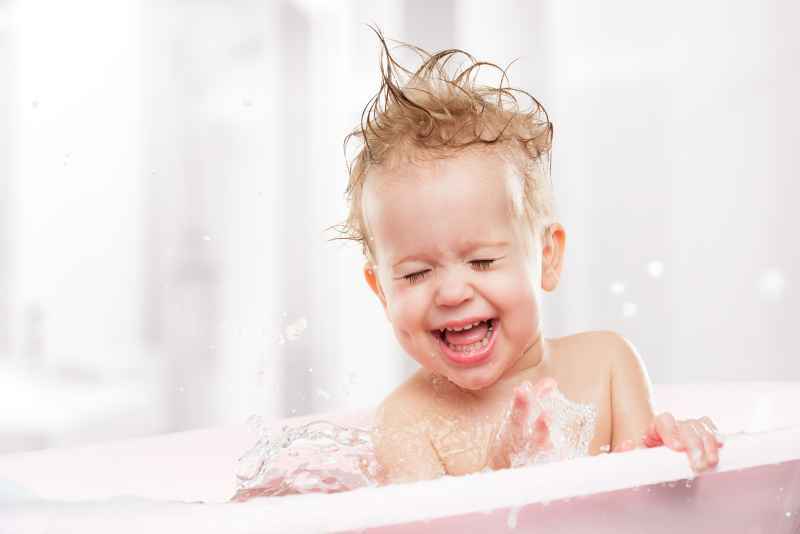 And children also love a bath! In any case, this boy is! 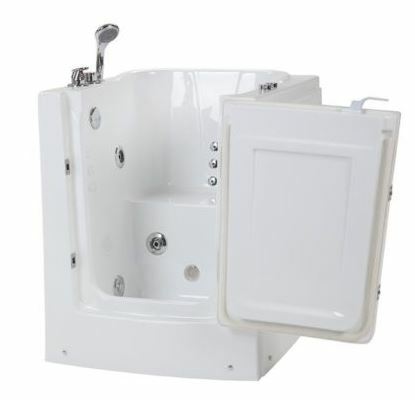 Alternatively, You can use even smaller tubs for a foot bath. Your feet are generally very "prone" to mineral uptake, especially when dissolved in revitalized water, and if You move, You can take it with You. First of all, we are legally obliged to tell You that whatever "story" we tell You, You should always consult Your "qualified" and "certified" medical specialists in advance. And, since we speak only from our own experience and are not "qualified" and "certified", everything written here is only for Your information and that You decide Yourself who or what to "believe". However, ensure that the information contained in this document is based on numerous scientific studies, the references of which are listed below. The reason we provide this information is because we were searching for these products - for ourselves, for our own use. If we share information on these pages, we have already extensively tested the product ourselves. For magnesium even more than three years. There are many magnesium products on the market and You might find it difficult to choose. Purity is one of the most important factors to take into account. Where is it extracted or extracted. Seawater is not as pure as it was 100 years ago and that is a big' understatement'. Mining companies tend to use all kinds of chemicals to refine the raw material. What is done to get it on the surface, what "impurities" were introduced to refine and purify it, what is done afterwards with the raw material, how it is stored and what type of packaging is used. A lot of "things" can happen before it lands in Your bath tub. Then the question is: how much do You need in the first instance? The answer has already been mentioned. If none of the effects or diseases mentioned do not occur, You will generally feel fit and awake, the shortage will be low. A non-existent deficiency is nowadays rather unlikely, because magnesium is consumed by Your body, especially if You practise sports, do hard work, but even when Your food and water is digested. Magnesium is used for hundreds of other processes in Your body. Then the next consideration is the form: as we wrote earlier, we have learned that the most effective form of magnesium salt flakes for Your bath tub is. So we investigated the market and found the purest product right around the corner.... in the Netherlands... our home base. Our supplier extracts his product directly from the epicentre of the old Zechstein Sea. We repackage it ourselves from our supplier's bulk deliveries into consumer-friendly packaging, so we decided to use the most efficient and least environmentally polluting packaging. Since salt-like substances tend to attract water, bodyRevitaliser Magnesium-Baddy salt should be packed in a sealed reusable bag in the following quantities >2000 grams for a large bath tub and >1000 grams for a small bath tub. (For a foot-bath You need 500 grams). Complementary is bodyRevitaliser Himalaya-Badzalt, as an optional but highly valuable and mineral-overflowing (83 minerals) addition, which is absorbed by the skin in a way similar to the recommended magnesium. Well so efficient, right? Magnesium "oil" is not a real oil, but a 30% solution of magnesium chloride flakes in - revitalized - water, which - possibly with other massage oil can be supplemented for a mineral-rich massage. Especially if You have to deal with muscle cramp, this is a very good and quick solution. Many physiotherapists have discovered this in the meantime. The magnesium oil is absorbed very well and quickly by Your skin during massage. You can have such a Miron Ultraviolet bottle (100 ml) with pump with bodyRevitaliser Magnesium Massage Oil, which protects the magnesium well against light and keeps it for a long time. The nanometre-small particles are small enough to be transported everywhere. Because of the universal play with the electron, these magnesium particles are attracted over where there is a shortage. Your Immune system - Your own resident "doctor", who has known You since birth and is concerned solely with Your Health - turns out to follow a certain sequence, programmed according to Your DNA. It could be established that, for example, magnesium is used for all kinds of processes in hormone production and digestion before being passed on to the body. It even went so far that the Immune system removed magnesium from the muscles for this purpose. bodyRevitaliser Colloidal-Magnesium, dissolved in water, is very easy to take in and is absorbed very quickly. Externally if You therefore have muscle cramp, but also internally, if You think/know that there is also a shortage internally in Your body. bodyRevitaliser delivers this in a Miron UV glass spray bottle, so that this magnesium has a long shelf life and is protected against 99% light. So although it is certainly not as effective as transdermal magnesium intake, we do not want to completely reject the "eating" of magnesium. It is, of course, easy to take with You. As we have learned in this article, magnesium citrate (added to citric acid from lemons) is - in addition to Colloidal-Magnesium - one of the most effective internal magnesium supplements. Magnesium in this form, however, is quite expensive. Therefore, we would recommend You to take the aforementioned cheaper Colloidal-Magnesium for internal use. In principle, You should provide Your body with enough magnesium to be able to process Your calcium intake in a 1:1 ratio. In any case, we must be careful and limit our intake in order to avoid unnecessary strain on our digestive system. bodyRevitaliser wishes to provide You with the purest, most natural and effective products with the highest bioavailability.